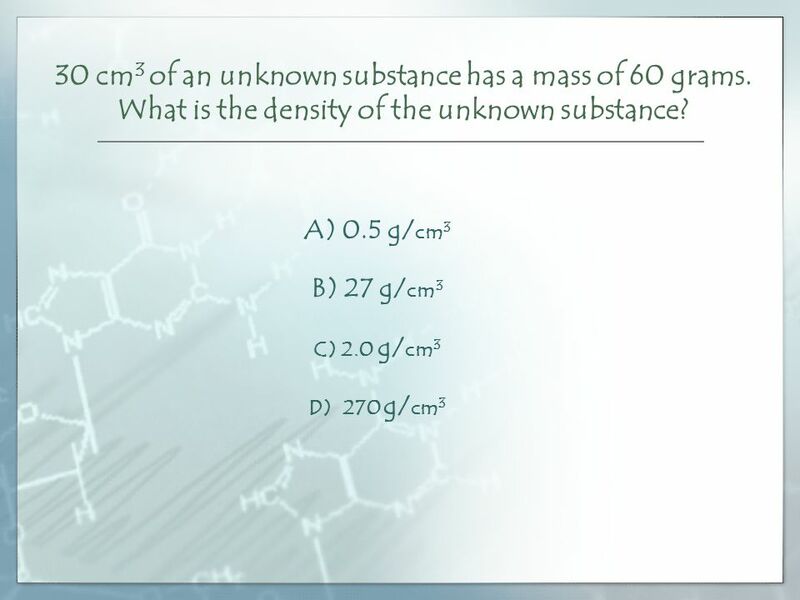 The Nature of Matter A low pH indicates that a substance is A) a base. B) an acid. 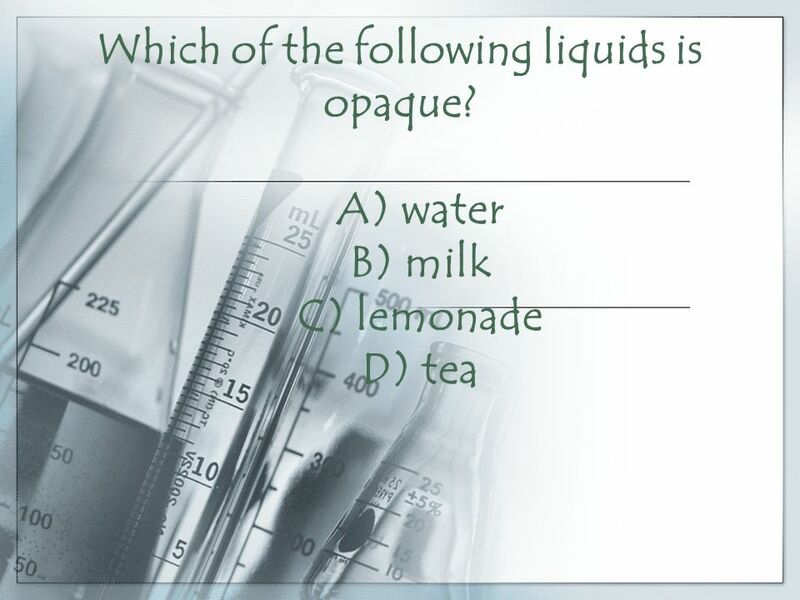 C) a carbonate. D) neutral. 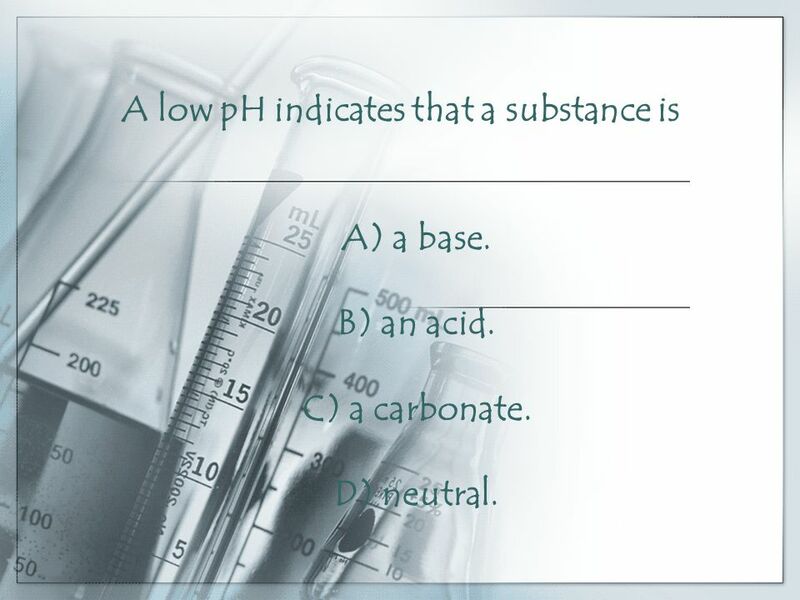 3 A low pH indicates that a substance is A) a base. B) an acid. C) a carbonate. D) neutral. 5 A robot explores a volcanic region and brings back two samples of rock. The rocks are different in size, but have the same density, color, and texture. 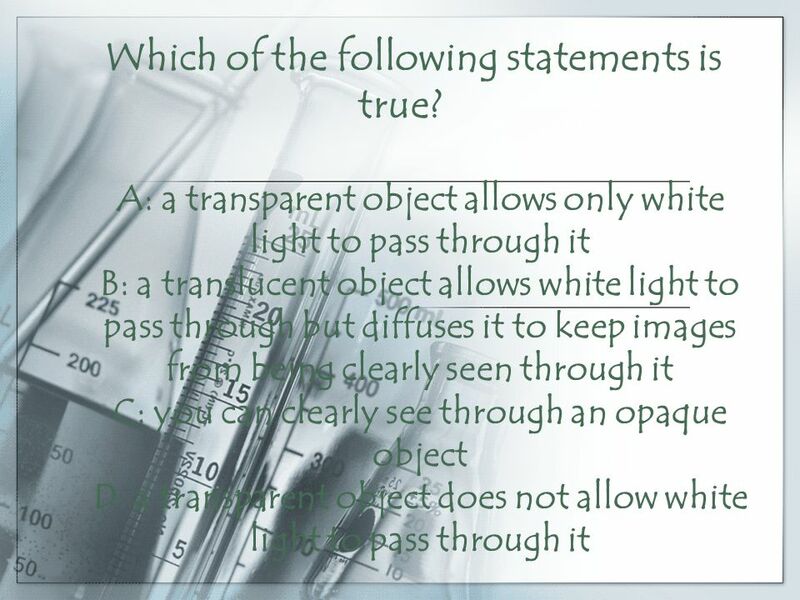 Which of the following statements is most likely true? ____________________________________ A)The rocks are from two different time periods. B) The rocks are from the same location. C) The rocks are made of the same type of minerals. 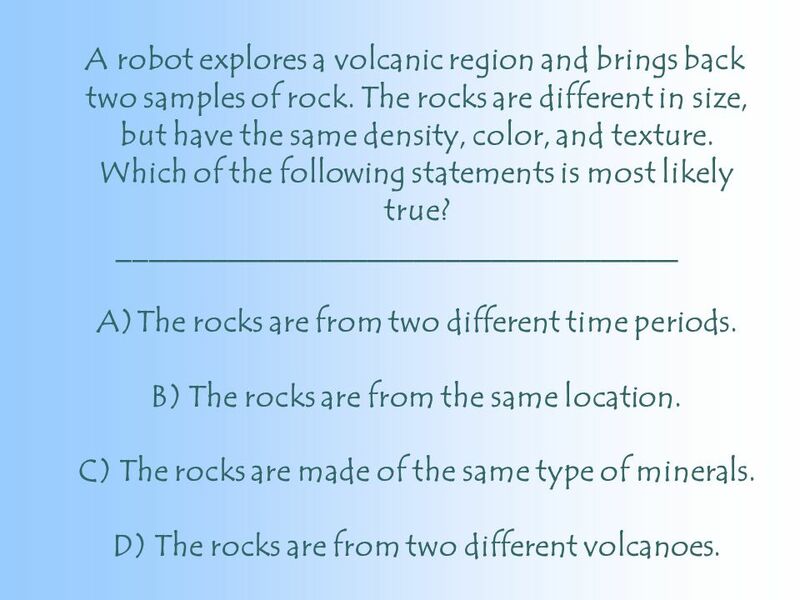 D) The rocks are from two different volcanoes. 13 Which of the following statements is NOT true? 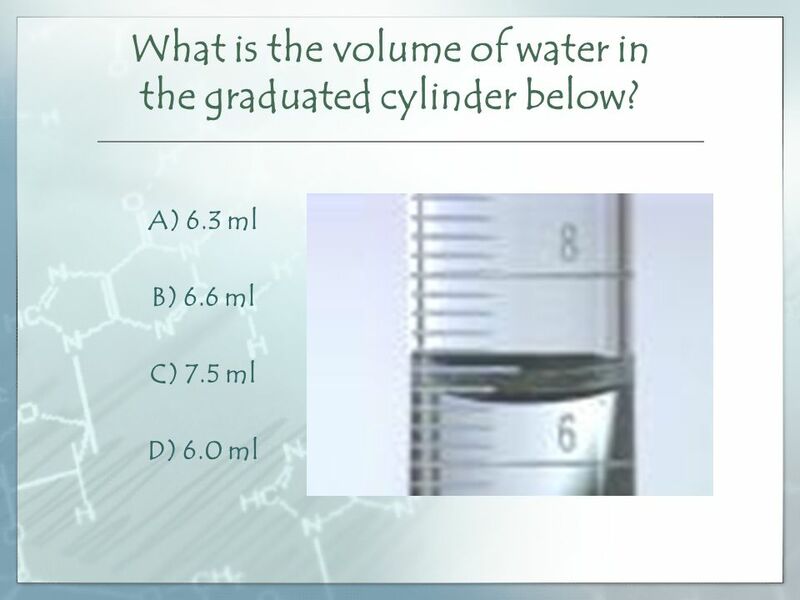 A) Gas A had the greatest increase in volume. 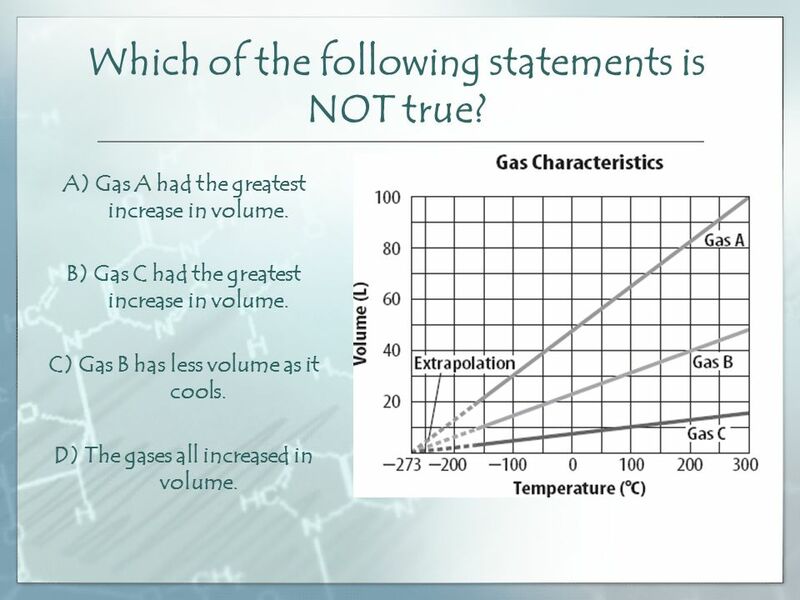 B) Gas C had the greatest increase in volume. 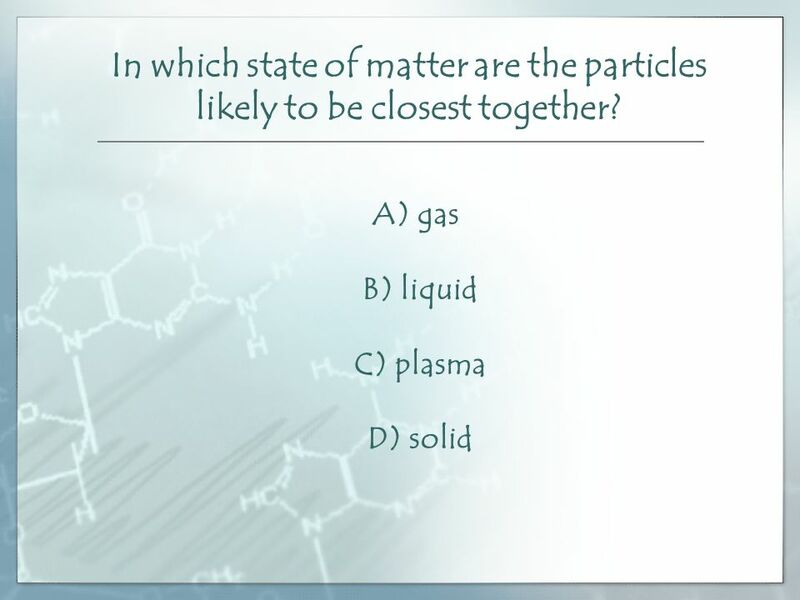 C) Gas B has less volume as it cools. 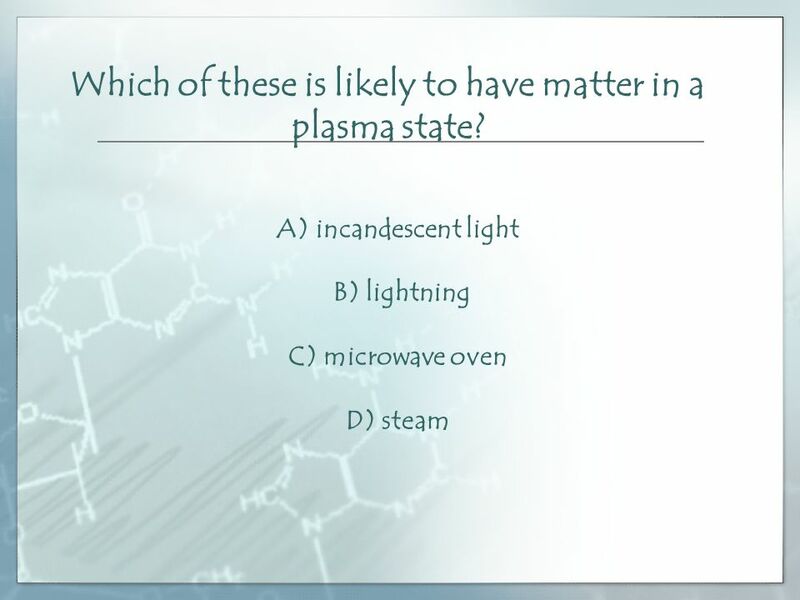 D) The gases all increased in volume. 14 The amount of energy needed to change a substance from the solid phase to the liquid phase is the... A) heat of vaporization. B) melting point. 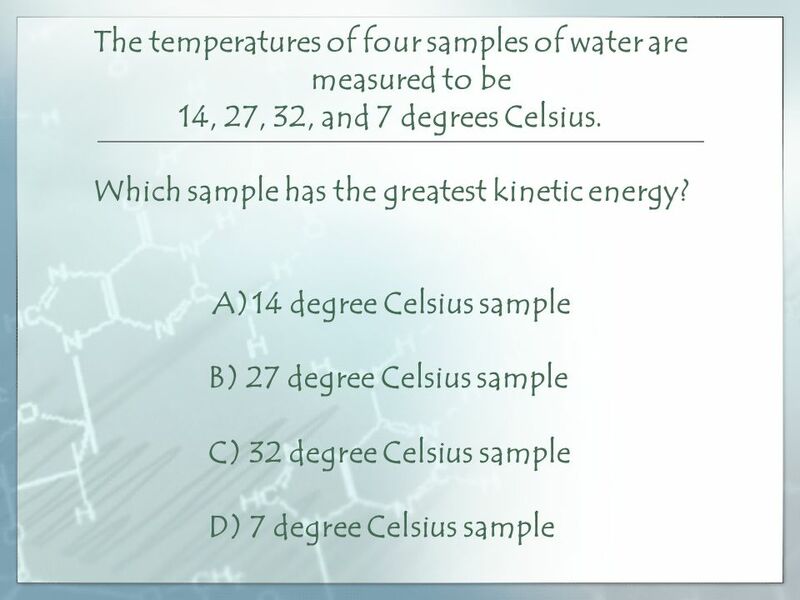 C) kinetic energy. 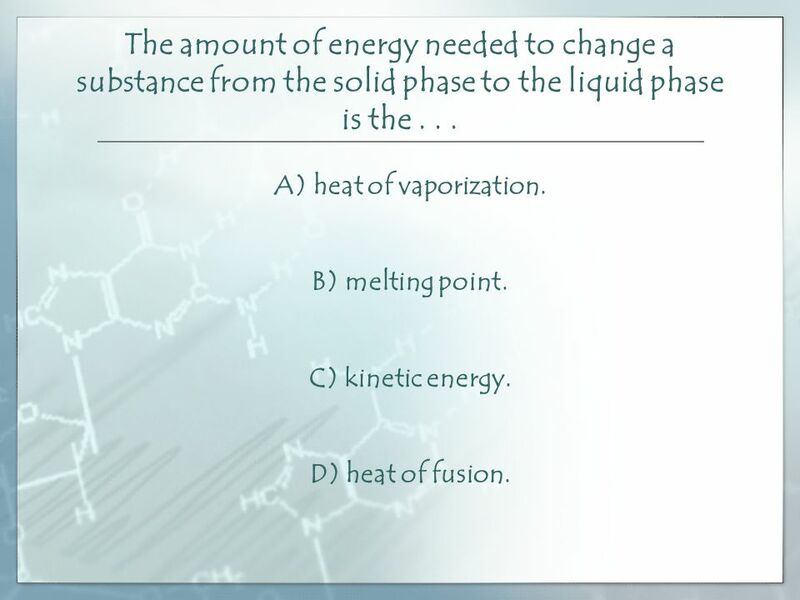 D) heat of fusion. 22 According to the following table, which of the following is NOT true? 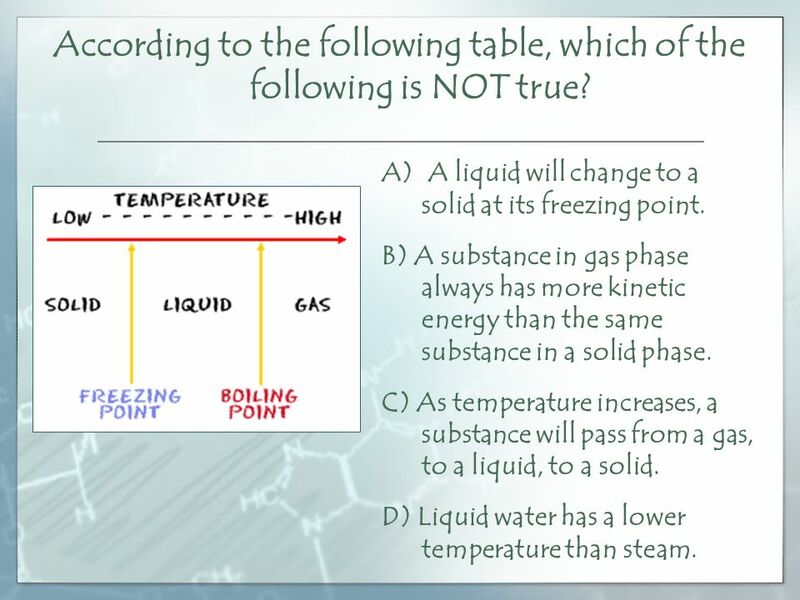 A) A liquid will change to a solid at its freezing point. B) A substance in gas phase always has more kinetic energy than the same substance in a solid phase. C) As temperature increases, a substance will pass from a gas, to a liquid, to a solid. 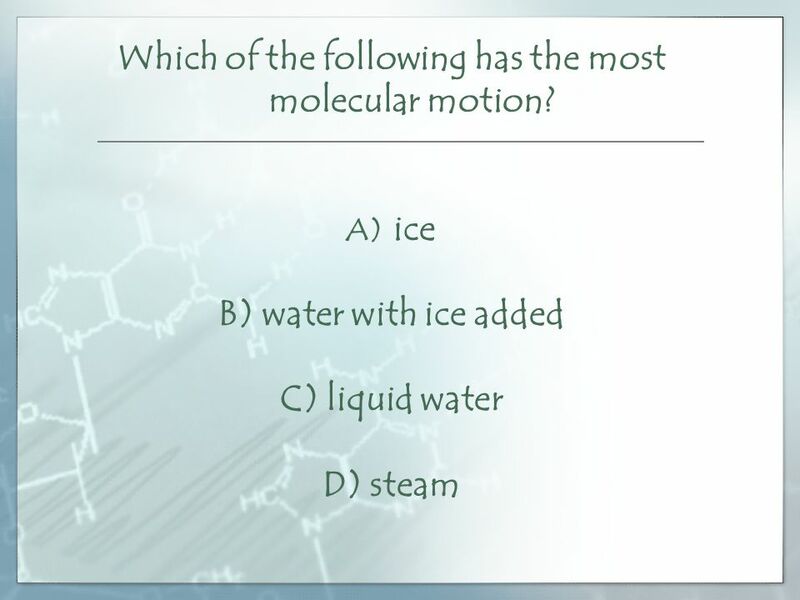 D) Liquid water has a lower temperature than steam. 26 Michaela is building a new home. She enjoys having a room filled with sunlight, but wants to prevent people from seeing into her office which faces a busy street. Which of the following would be a good option for Michaela? A) Do not place any windows in the walls of her office. 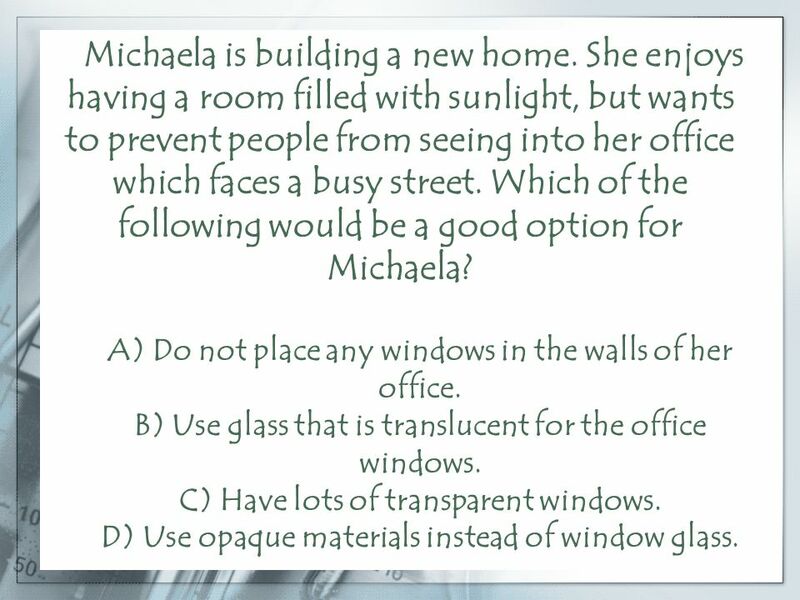 B) Use glass that is translucent for the office windows. C) Have lots of transparent windows. 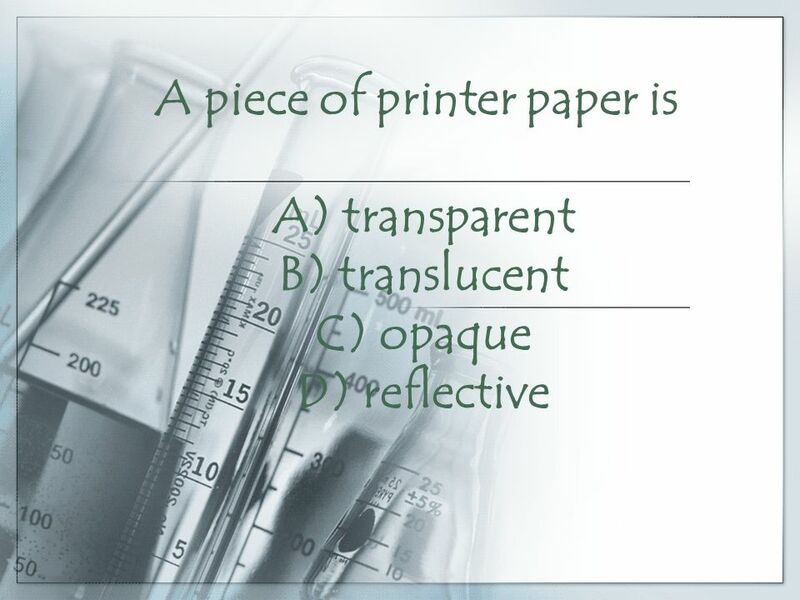 D) Use opaque materials instead of window glass. Download ppt "The Nature of Matter A low pH indicates that a substance is A) a base. B) an acid. C) a carbonate. D) neutral." Warm Up On page 11 of your science notebook: On page 11 of your science notebook: Do the following for each of the four items at your desk: Do the following. What is Matter? Properties of Matter. Four States of Matter Acids and Bases Generalized Formulas, PH Q $100 Q $200 Q $300 Q $400 Q $500 Q $100 Q $200 Q $300 Q $400 Q $500 Final Jeopardy Phase. When you get a question right, click a shell to reveal your score. Chapter 10 Review. What is the heat in Joules required to melt 25 grams of ice? 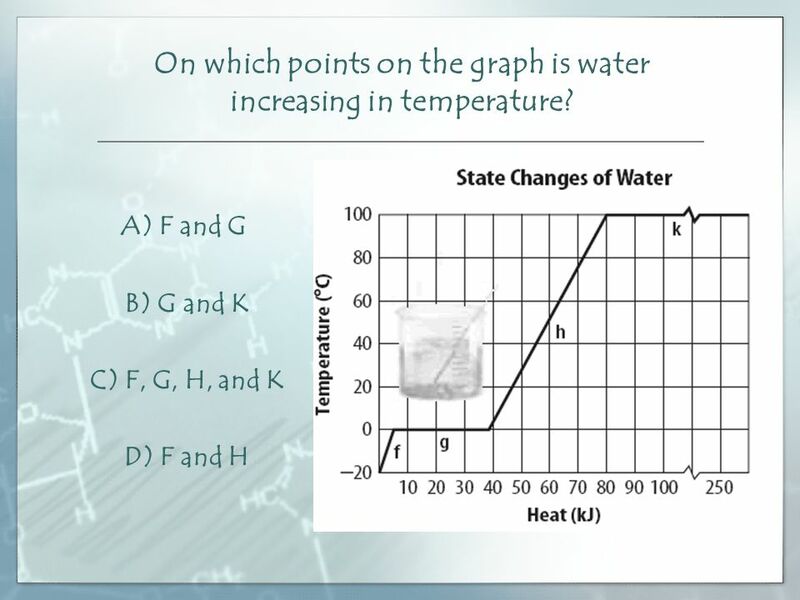 Useful information: heat of fusion of water = 334 J/g q = m·ΔHf q = (25. Phase of Matter. Phases of Matter Gases indefinite volume and shape, low density. 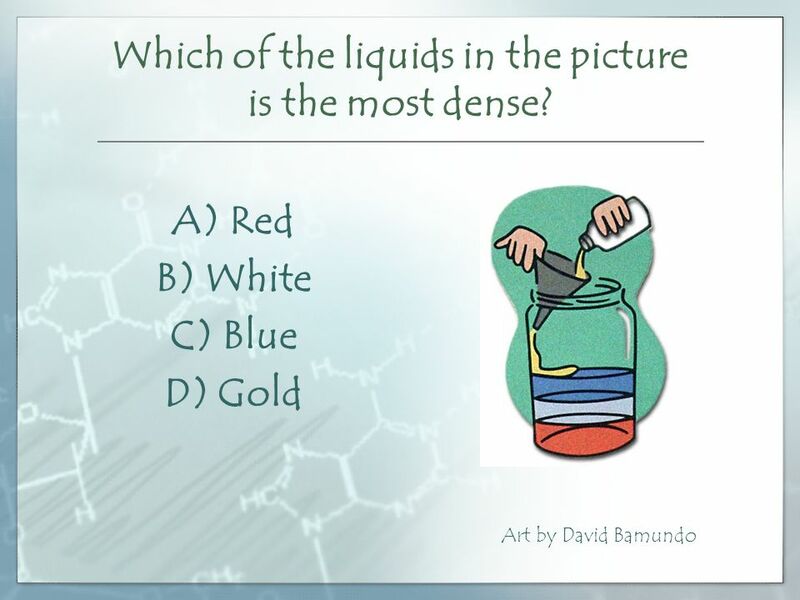 Liquids definite volume, indefinite shape, and high density. Solids. Physical and Chemical Properties Solutions, Density, States of Matter, and pH Test Prep. 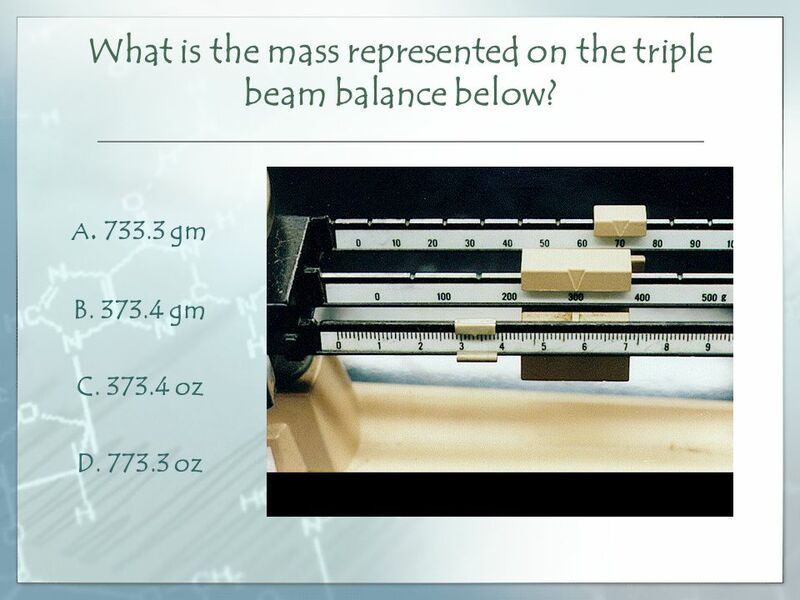 Matter Unit Review Game Write down your answer first. If you get it correct, write down the number of points you earned. If you get it wrong, don’t write. Aim: What is density? Density: The concentration of matter in an object. 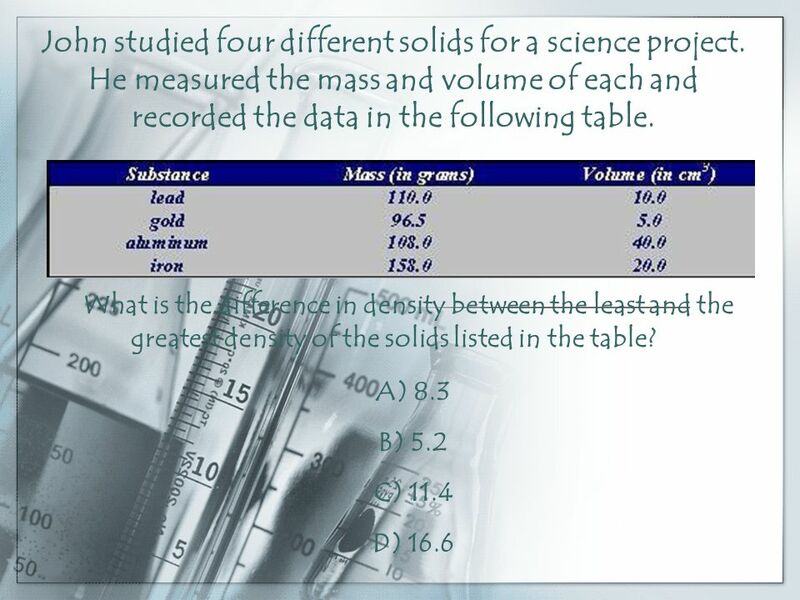 Density is very IMPORTANT in the field of Earth Science. Why? Example: global. 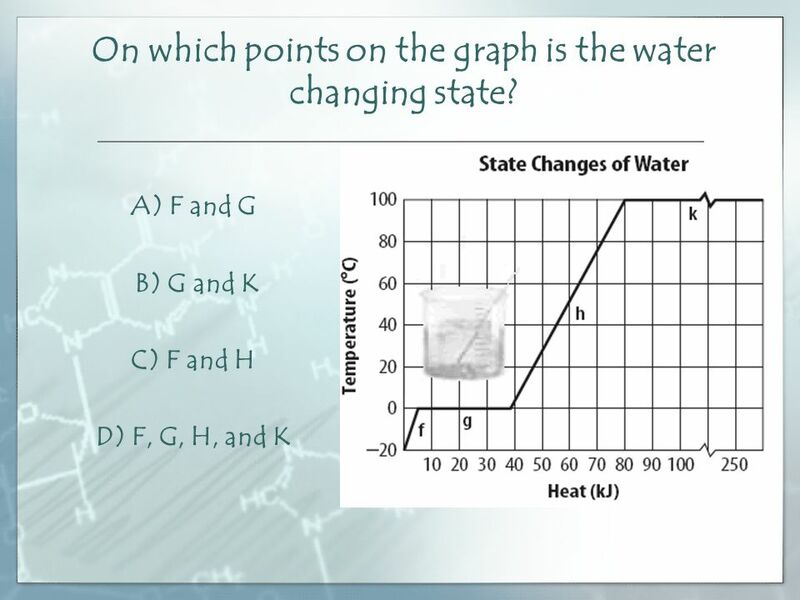 Student will learn: 1. to read Phase diagrams 2. math calculations of energy for melting, freezing, vaporization, condensing or raising temperature of.  Energy is transferred ◦ Exothermic – heat is released  Heat exits ◦ Endothermic – heat is required or absorbed by reaction  Measure energy in Joules. Chapter 3 Review MS Science. Density. Computing Density Density = mass (g) volume (cm 3 ) DETERMINE VOLUME: DETERMINE MASS: RT = Pg. 1. Properties of Matter Physical Properties, Phases of Matter, Chemical Properties. Matter. 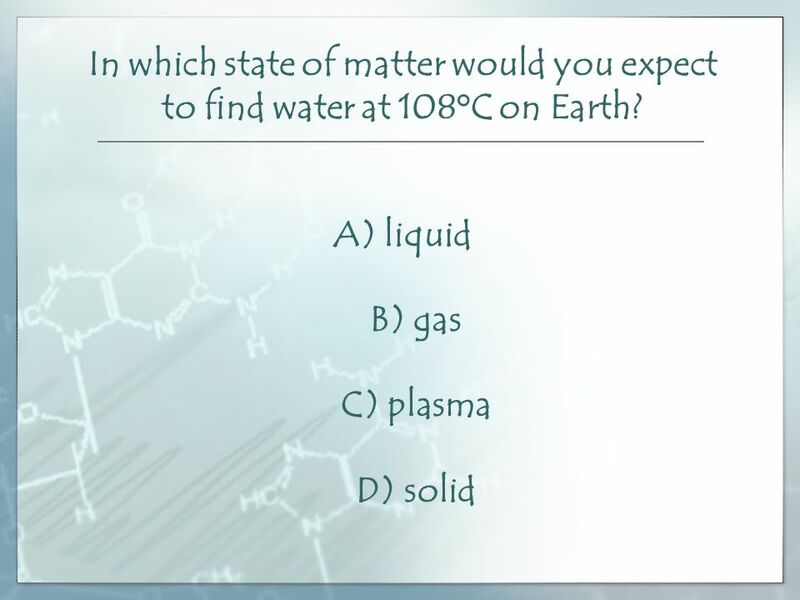 Review States of Matter Solid Liquid Gas Plasma. SPI 0807.9.6 States of Matter A) Leave your books at your desk. Then go to a work station. Reminder: no more than four students per work station 1) Draw.